Techmont has a long track record in the detail engineering, engineering analysis and manufacturing supports for a large range of equipment for Oil & Gas, Petrochemical, Power & Water industries like reactors, pressure vessels, towers, columns, storage tanks, steam drums, brine heaters, pressure parts for heat recovery steam generators and complete process modules. With extensive knowledge of ASME, API, ASTM, ANSI, API, ISO, DNV, ABS, BS, EN, AWS & NACE, we can design to various codes where stringent parameters are necessary to meet our client's product specifications and project goals. We are able to adhere to all customer specifications and code requirements. Techmont’s dedicated and experienced team of engineers involved in designing of pressure vessels, vertical columns to ASME Sec. VIII Div.1 / Div.2, ASME (2010) Section-1,IBR-1950, ISO R-8 31, IS 2825, IS 4503, BS 1113, PD 5500 DIN, AD Merkblatter, TEMA etc. Heat Exchanger as per ASME VIII-1/ Div.2 & TEMA. 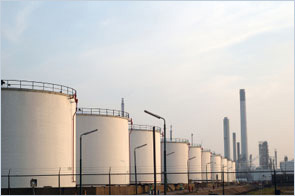 Storage tanks as per API 650, API 620 & BS 2654. We provide a complete pressure vessel design package tailored to meet client requirements in temperature, pressure, chemical, and geometry. We are experienced in the design of vessels in all sizes ranging from small testing applications to large process columns with a variety of shapes including cylindrical, spherical and rectangular. We provides design calculations, detail engineering & fabrication drawings as per client requirements for Scrubbers, Test Separators ,All Type of Filter Vessels, Coalescer Vessels, Knock Out Drums, Deaerator, Reactors, Columns, LPG Tanks. 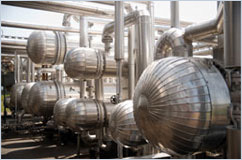 Our expertise includes different types of heat exchangers like Shell & Tube, U -Tubes, Brine Heaters, Condensers, Fixed Tube Sheets, Fin Tubes, Evaporators, Tube Bundles. 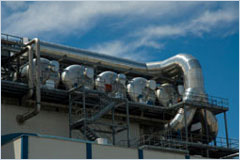 Client is specialists in air cooled heat exchangers for the Petrochemical and Allied Industries offer a complete package of design, supply and erection of Air coolers. Client wants to verify stress generated in the nozzle because of the loads acting over the component due to internal pressure and Nozzle loads. 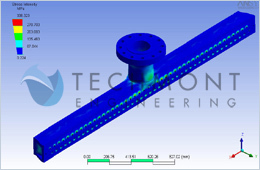 Client provided us with the 3D Model of the inlet header assembly. Our R&D team performed the Finite Element modeling, Applied Boundary conditions and Loading conditions and solved the FE Model for results. Overall stress intensity distribution over the corroded inlet header due to internal pressure. Our Engineering team is well expertise in designing and Detail Engineering of Pressure parts of Oil filled equipments like mobile trailer mounted loco type boilers, too N3 phase. Horizontal/Vertical Separators, Industrial water bath heater, Heat Theater, skid mounted oil well testing units. Techmont’s engineering team is fully equipped with the practical design aspects of pressure vessel components such as access hatches, platforms, davits, insulation, baffles, nozzles, and support structures. Standard design details are utilized whenever possible to maintain an economical design. However, we also have a proven record of developing creative designs for specialized research, chemical and nuclear applications. Techmont’s Engineering team having more than 11 Years experience in Design and Detailed Engineering of storage Vessels like oxygen, nitrogen, ammonia, Propane, Butane, Fuel tanks for LPG, furnace oil HSD, water storage tanks etc as per API 650, API 620 & BS 2654,AWWA D100, and ANSI B96.1 standards and certifications, as well as to customer specified design criteria. We capitalize on our global expertise and local knowledge to safely and reliably deliver projects virtually anywhere in the world. 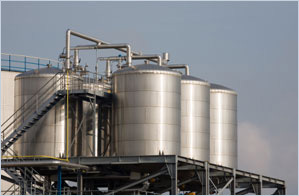 The Tank Division serves various industries including Refineries, Petrochemical, Oil & Gas, Waste management, Construction, Chemical, Cement, and Food & Beverages. 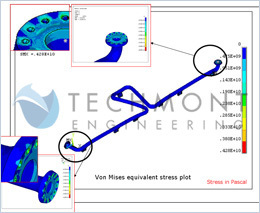 Client was interested to carry out the FEA stress analysis and to get an idea about the maximum Stress due to internal, external, hydro test, seismic loads in the Mounded Bullet for deformation and Stress intensities for different load cases. Client wants to find the stresses due to internal, external, hydro test, seismic loads for mounded LPG storage bullet. Our engineering team prepared the Solid model in 3D CAD software, Performed Finite Element modelling, Applying Boundary conditions and Loading conditions and done the Solving of FE Model for results. The deformation and FEA stress Intensity plots for 6 different load cases were conducted and observed that the actual stress intensities are peak stress values also membrane stress, membrane + bending stress & local stresses, deflections are checked with respective allowable values and found to be within limits. 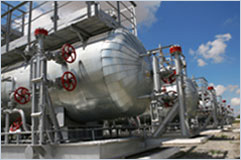 Techmont offers the detail engineering, engineering analysis and manufacturing support for complete chemical injection skids, customized system packages which includes the Fabrication of Vessels, Heat Exchangers, Structural’s (both Primary & Secondary), Piping Spools & Supports and assembly of these along with the E & I, Valves, Pumps, Blowers, Burners etc. 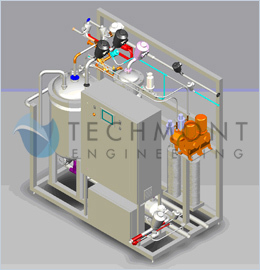 One of the leading design and manufacturer’s of stainless steel equipments for the Biotechnology & Life Sciences, Food, Dairy, Beverage, and Personal care Products Industry chose Techmont to support in the design and development of CIP and SIP Skid for 100liter, 200 liters, Mobile SIP and Recirculation skid. Client’s requirement was to develop the design and detailed fabrication drawings of complete CIP Skid including the piping plan based on the P & ID provided. 3D Model of Complete CIP Skid including the Piping was done in Solid Works 2006. 200 liter tank with dish-end top was designed using methodology similar to previous tank designed at the company. Heat exchanger was designed considering the plant steam input values provided by the client and capacity of heating required. Selection of pumps was done on the basis of total pumping head required and application, and also on client’s prior experience. Complete piping was designed after modeling the heat exchanger and tank on a Skid base. The piping was designed considering necessary slopes for the flow of water, steam, acids and alkalis avoiding dead lags, and also such that it would fit in the given space. All piping dimensions were considered using BEP code. Client deals with the air cooled heat exchangers for the Petrochemical and Allied Industries offer a complete package of design, supply and erection of Air coolers. 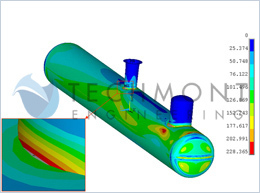 Client had chosen Techmont to carry out Static stress analysis of the natural gas condenser support structure. Client wants to verify before manufacturing, whether the structure design is capable of withstanding the wind load. 3D modeling and detailed FEA models of the designs were constructed. 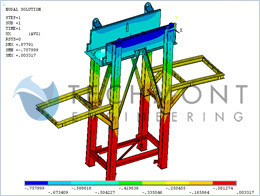 As per the client requirement static stress analysis was done for the support structure by applying the wind load conditions. After comparing the data from the tests and the results from the analysis we concluded that the structure is in Safe condition. FEA Static stress analysis combined with thermal stress of 143kw expansion loop condenser pipe. 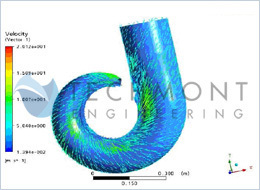 Client, one of the leading oil and gas Company employed Techmont to carry out Static stress analysis combined with thermal stress of 143kw expansion loop condenser pipe. Client requirement was to verify stress generated in the expansion loop of condenser due to fluid pressure loads, structural loads from client end and thermal loads. Detailed FEA models were prepared to carry out FEA under different loading conditions which include Stress Analysis of the corroded Expansion loop pipe with nozzle loads, Stress Analysis of the corroded Expansion loop pipe with internal pressure and Stress Analysis of the corroded Expansion loop pipe with internal pressure and nozzle loads. Based on the FEA results, stress generated in the expansion loop of condenser due to fluid pressure loads, structural loads from client end and thermal loads were verified and found that the thermal load is the primary contributor towards the stresses in the pipe and the stresses in the end flanges is Compressive in nature. Client, one of the leading EPC services provider was interested in performing CFD analysis to predict performance of the existing design of the mixed flow centrifugal pump to check its suitability for updated duty parameters. This pump finds application in Pumping drainage water, storm water, Water supply schemes, Irrigation, HVAC systems, Power. The objective of this analysis was to predict hydraulic performance of new design at design stage only which will reduce development cycle time and to simulate the flow pattern inside the pump casing and impeller are bought out at design stage. As a result the areas of improvement can be identified in the product design stage itself. CFD analysis of the existing hydraulic design of MFE 200 pump was carried out at three different flow rates. The total head developed and efficiency at above three points was compared with actual test results. Also necessary boundary conditions were applied to the model. Comparison of results from CFD and actual testing was done. Total head and efficiency values from test results and CFD analysis at constant flow are almost similar.CFD analysis supported in predicting hydraulic performance of centrifugal pump at design stage itself. Necessary recommendations were provided to improve the efficiency of Mixed flow centrifugal pump with the areas of improvement.